Miss Edna's Place: Where is Technology Heading? Good morning. It's still quite warm here in New England. Today will be another day in the nineties, then tomorrow should hopefully drop back down into the eighties. We shall see. By next Saturday, temps should get back down to the low eighties. Now that should be a good day for Pogo and me to get out and do a few errands. Last week, Audrey and Mac attended the Taxidermist Convention in North Carolina, and they took granddaughter Alena with them. They have classes and awards for the children as well as the adults. 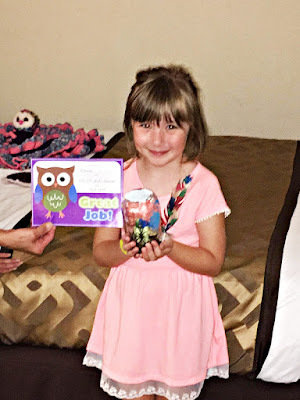 Here is Alena proudly showing her project and her award. She made a jar with a butterfly and a dragonfly in it, and painted a feather rainbow colors. Great job, Alena. Great Meema is very proud of you. Mac tried his hand at sculpting again. This is his second piece, and it is a Bobcat head. He won an award for it. 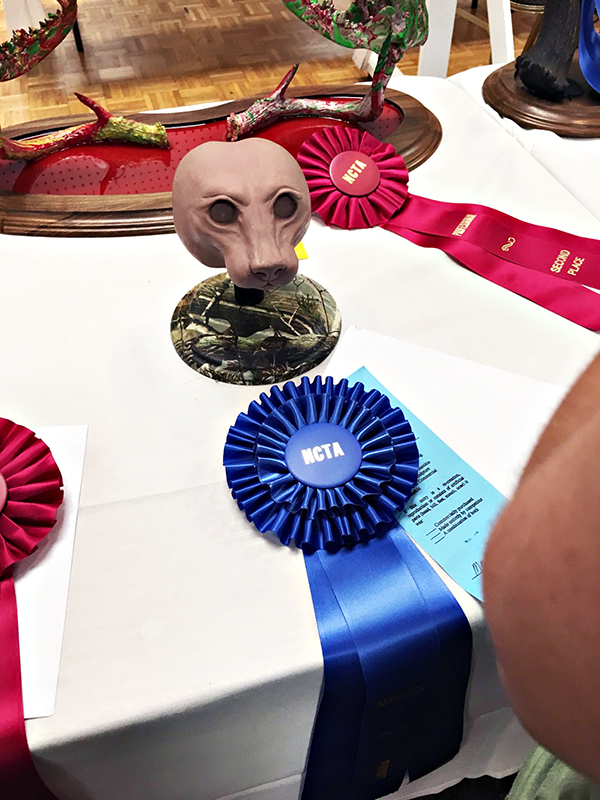 "The NCTA State Champion" in original art, Master Division. Awesome, Mac! Yesterday, I made some phone calls and found a dryer repairman who can come out tomorrow to fix my dryer. Audrey says I should just buy a new dryer. The one I have is old, and a new one shouldn't cost a whole lot more than repairing the old one. I will have to make a decision on this today. I have been watching the electronic shows on the Shopping Channel these past few days, and I am in awe of some of the new technology. Tablets are becoming more like laptops, cameras and printers are getting smaller, home security systems are getting more sophisticated, and the list goes on. It is just mind boggling. I keep thinking that one of these days I'll have to get a new laptop, but then I think of all the changes that I'll have to learn and I back off from that idea. The older I get, the less I like change. Although, one of these days I may not have a choice. Yesterday, the new toilet seat that I ordered arrived. The old seat is starting to give everyone a pinch on the left cheek so it's time to get rid of it. Imagine that! Getting pinched by a padded seat! Deanne is coming over soon to put the new seat on for me. Thank you Dee Dee. I found an interesting article in one of my magazines, "Popular Science." It was an article titled "I Wish Someone Would Invent," and I thought I would share this new bit of technology with you. 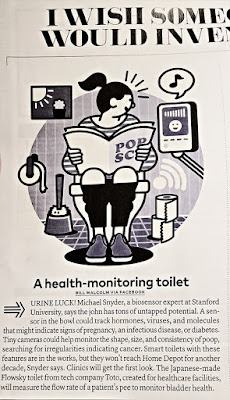 It's a health-monitoring toilet. Can you imagine? 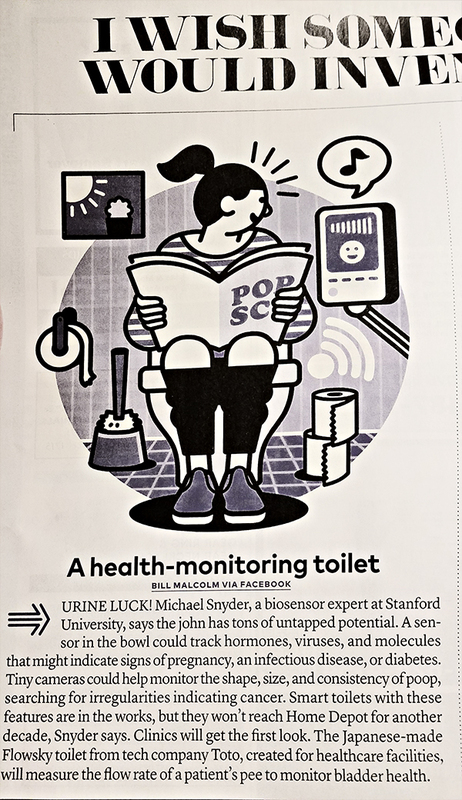 Will we have no privacy in our lives any more with all this new technology? I think I'll pass on this item. Now I think I'll drink my coffee and check a couple of blogs before Deanne gets here. So, till tomorrow, Y'all have a fantabulous day. The photos of the kids are so sweet. And yes, it is amazing to see how much energy those little ones have, even in that muggie and warm weather. May be Audrey is right saying that you could buy a new dryer as well. It is often so, that repairs cost so much that with a little bit of extra you have a completely new one.Well, wiat first to hear what the repairman says. We had some cvery warm days here too, but today it is cloudy, with even some rain and lower temperatures. They say there might be some real hard wind this evening, hope it will not be too bad. But then next days weather will be better again. I am grateful for some rain, and I am sure the farmers will be very happy with anything of rain.